Meet the newest member to our APEC Tuned family. The car's previous tune from another tuning house just wasn't cutting it. APEC Tuned worked it's magic and the results speak for themselves! The previous tune was 208kw and 437nm. 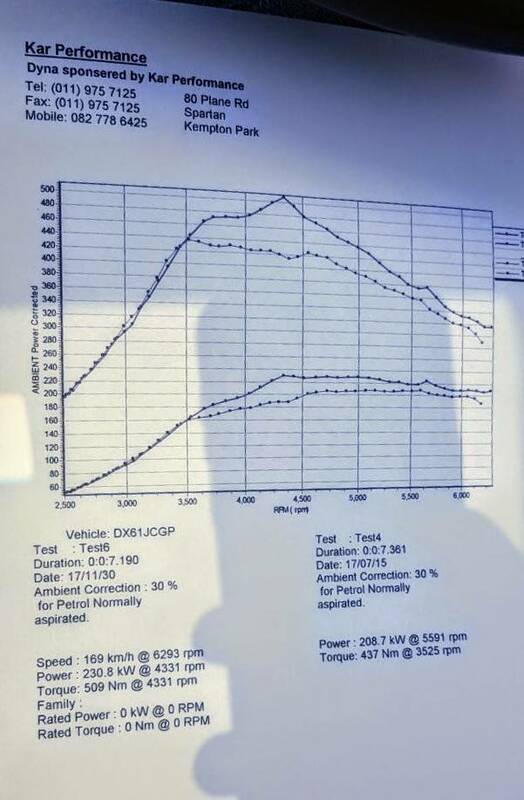 With it's current custom APEC Tuned software the car now pushes 230kw and 509nm ATW! The only thing changed on the car was the tune, no hardware mods were done. The power runs were done at #KAR using 95 pump fuel only. Lekker. That's quite strong on pump fuel. Intercooler and WMI still need to be done. The clutch is also on its way out so we lost a little power there. We'll keep this updated as the car progresses. Does the car have hpfp? Do you have a full graph pic? MSBGTI wrote: Does the car have hpfp? The car does not have a hpfp. Here's a pic of the graph, you can see clutch acting up on the run. Once the clutch is sorted the graph with smoothen out nicely. so this A3 is running stock injectors and fuel pump and is pushing 230kw? SO NAWTY-ZN wrote: so this A3 is running stock injectors and fuel pump and is pushing 230kw? That is correct. It has the EA888 motor, the OEM pump and injectors don't need to be changed. That's a big difference in power.